This is the fifth part in a series of discussions regarding The Idle Parent Manifesto, which can be found in Tom Hodgkinson’s book The Idle Parent: Why Laid-Back Parents Raise Happier and Healthier Kids . Need to get caught up? You can do so here. My husband turned 41 this year. He’s not a big party person, so when he asked for a Mardi Gras party to celebrate his birthday I was more than happy to honor his request. He asked for Cajun food, King Cake and hurricanes. Since I’ve been inspired to cook more from scratch lately (thank you Six family! ), I bought all the ingredients for hurricanes and invited my neighbor, Michelle, over to experiment with recipes. We mixed, we tasted, we nailed it. 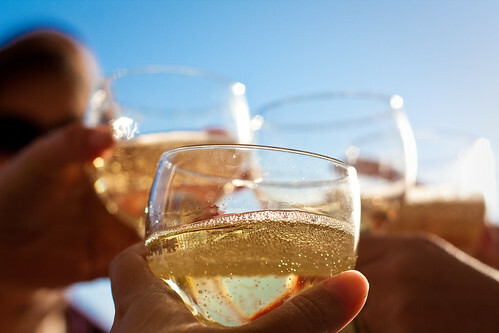 Which brings me to Idle Parent Manifesto Point #5: We drink alcohol without guilt. 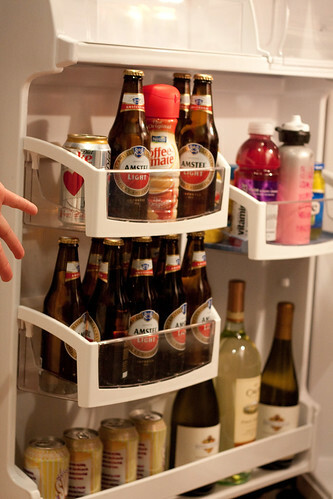 Everything a mom needs to get through the day: coffee creamer, Diet Coke, and alcohol. I gave up alcohol for nine months while I was pregnant and for eighteen months while I was nursing. BOTH KIDS. I’m allowed to have a cocktail. I have paid my dues and I’m an adult. It’s not like college anymore. We start drinking a little earlier these days. I go to bed at 9 PM and get up at about 6:30 every morning so 4 in the afternoon is the new 9PM. I drink at home. It’s cheaper and I don’t have to worry about driving. No one gets snockered anymore. I drink because I like the taste. I drink craft beer and Tito’s Vodka. And honestly, it just makes some days flow a little smoother. Five games of Candyland in a row? Really? Five games of Candyland and craft beer? OK! Twirling the jump rope for 5 neighborhood kids in 95 degree heat? Not so much. Doing it while listening to the tinkle of ice cubes in a Car Crash (recipe to follow)? Sure! Try it for a month. Yes, the neighborhood moms might raise their eyebrows and maybe even talk about you for a while. But they’ll still drop off their kids at your house for playdates and I guarantee that if you can mix a mean Hurricane, they’ll start to show up at around 4:00 on Tuesday. Excluding those who abstain for religious or personal health reasons, do you find a little alcohol now and then makes parenting a little easier? Do you feel guilty about it, or are you the first one to raise your glass? Is it super dry where you live, too? I don’t know about you, but I have so many activities I’ve pinned or saved for a rainy day … and the rain never comes! We also have water restrictions where we live, so we’re limited on outdoor water play unless it involves going to the pool. Are your kids fans of the Fruit Ninja app? Mine love it, and would totally dig some live action Fruit Ninja. They’re pretty much always up for something that involves hitting things with swords, but add water and you have a recipe for summer awesome. This newspaper fort would be a great way to build a nice little nook for reading or escaping from siblings. Heck, I think I might build my own … maybe even put a little minibar in there. Have any Hunger Games fans in your house? Make a bow and arrow for under $1. It also involves a trip to the hardware store, which is always a good diversion during the dog days of summer. I’ve always wanted a balance board for the kids, but could never convince myself to spend the money. Love this tutorial for making your own, with materials you probably already have on hand. Next time I go thrifting, I’m keeping my eye out for a blender. I’m not sure Eli’s ready for it, but I know Elena would love it. She loves coming up with her own concoctions both outside and in the kitchen. And if she breaks it? A new appliance for Eli to dismantle! Growing the Risky Family: Welcome Lisa! I’ve been fortunate from the very beginning of launching The Risky Kids to have so much support. So many have you have shared with me that The Risky Kids is helping you in some way – whether it’s to feel like you’ve met a tribe of parents who share your philosophy or whether it’s to use us as a resource to stretch beyond your comfort zone as parents. Whatever the reason, it makes me so happy. I know, however, that this could be so much more. If only we had more hours in the day! Or more help! And then it hit me: who says I’m the only one who has something to offer here? I might not be able to make more hours magically appear, but I can definitely recruit someone to help out. Friends, I’d like you to welcome Lisa Abramson to The Risky Kids. From the very moment I had the idea for the blog, Lisa was my biggest cheerleader. Not only does she always have my back, she also inspires me to be more adventurous. 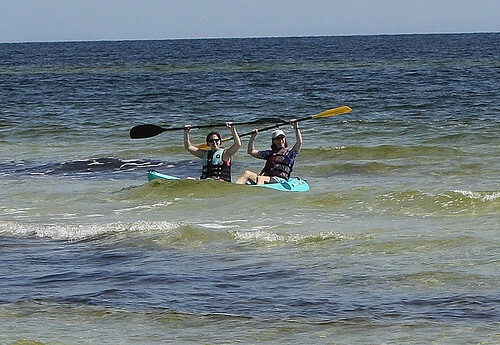 Only Lisa can get me away from my People magazine on our annual Girls’ Trip to kayak into shark dolphin-infested waters. That’s tenacity, people. She brings that same spirit of adventure into her family life. Lisa is married to Roger and lives in Nashville, Tennessee. She’s the mother of two boys, Thomas (9) and Ben (5). We first met in a playgroup when Thomas and Elena were just babies. Like me, Lisa has seen her parenting philosophy change as her kids have grown and she’s become a more seasoned mom. She writes, “I was a risky kid. I walked on top of the monkey bars. I did back flips off the swings. I had a mini-trampoline in my college dorm room. Then I had kids of my own and I will be the first to admit it – I hovered. I spent my days swooping in and yelling things like “Don’t touch!” and “Get down!” Lucky for my kids my husband wasn’t having any of it. It took many years but he brought me back to my risky roots. We both choose to do this not because we have all the answers (believe me, we don’t! ), but because we love the way it challenges us to think about the way we parent and live out our lives. From here forward, The Risky Kids will be a partnership between Lisa and I. You’ll still see lots of posts from me (and on the rare occasion a post from Mike), but you’ll be seeing Lisa’s writing as well. It’s our hope that by partnering with each other, we can bring even more awesome to The Risky Kids, with more topics, more viewpoints, more posts, and more inspiration. 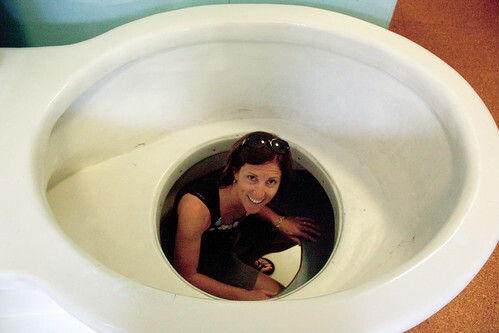 And hopefully, more photos of giant toilets. Welcome to The Risky Kids, Lisa! I can’t wait to share more adventures with you and all of our awesome risky readers! 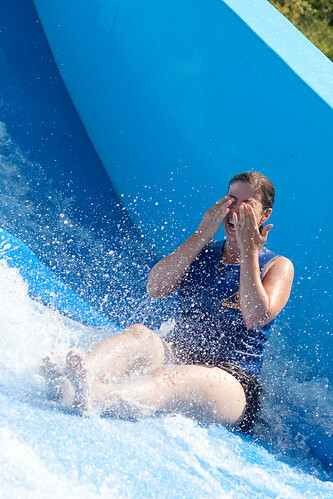 One of the downfalls of living in landlocked Indiana is that it doesn’t leave much opportunity to try out thrilling water sports. We don’t own a boat or know anyone that does, so forget tubing or water skiing. We could kayak, but our Hoosier waters tend to be calm – no rapids for us, especially in this drought. The bodies of water we can claim don’t boast giant waves, or even medium waves for that matter … until now. 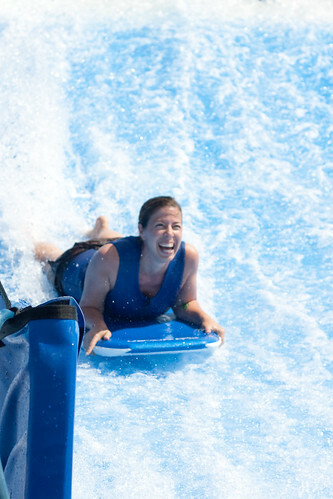 FlowRider is Indiana’s first simulated surfing ride, and you can find it at The Waterpark at the Monon Community Center in Carmel. 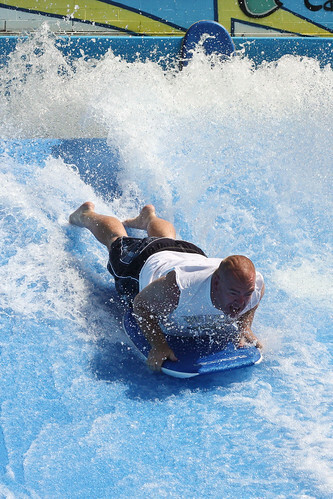 With 30,000 gallons of water flowing through every minute, rushing at 30 mph, it’s the closest most Hoosiers will get to surfing without a plane ticket. Lessons aren’t required to participate, but they certainly help. 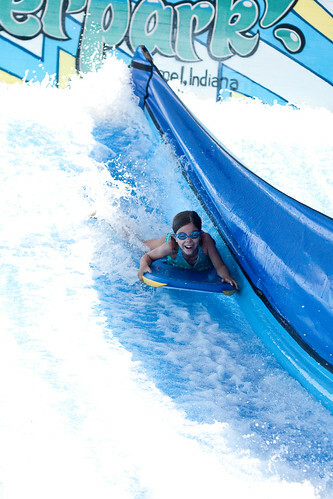 You have the option to ride the wave body board-style, on your knees, or for the very adventurous, standing up. You do have to be 48″ tall to ride, so Eli was out (sad trombone). Elena and my nephew, Marc, were all over it. Why should the kids have all the fun, though? We might be The Risky Kids, but every once in a while The Risky Parents want to play. And really, what’s riskier for a grown woman than posting a video of herself in a bathing suit for all the internet to see? If you live somewhere other than the great state of Indiana, don’t fret. 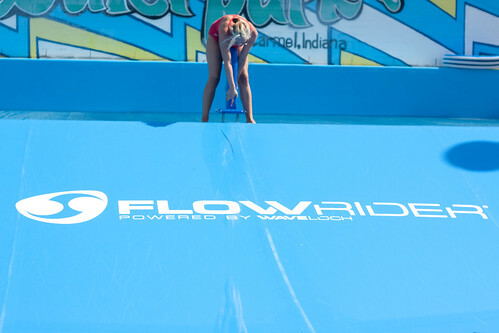 You can find FlowRider at venues all over the world. We never made it to standing up, but with more practice I’m sure we could. And then, just maybe, we’ll be ready for some real waves on a coastline far, far away. For now, we’ll just keep catching our waves in Carmel. 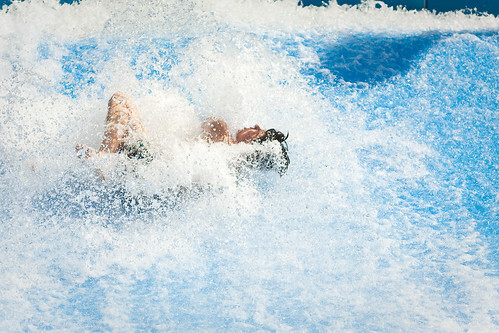 And, really, isn’t wiping out so much more fun without jet lag? Here at The Risky Kids, we’ve always tried to make good choices when it comes to our kids’ gear and playthings. Not only do we want well-made things that encourage open-ended play, creativity, or movement, but we want to buy them from the right people. Magic Beans, a Boston-based toy and baby gear store, fits the bill for us. I met Sheri Gurock, who owns Magic Beans with husband Eli, at BlogHer in 2009. I loved the idea of parents, who really are the experts in knowing what works and what kids love, helping parents like me find the best in toys and gear out there. And while we can’t shop locally (which we always love to do), we can certainly feel good about supporting a family-owned small business. If you’re like us and can’t get to Magic Beans in person, don’t fret. Their online shopping experience is top-notch. I love their Top 10s lists, as well as their gift guides, which help you narrow choices down by age, gender, price, theme, and more. Check out the Wobble Deck! Balance boards are perfect for Risky Kids trying to improve their balance, coordination and reflexes – you know, for all the tree-climbing, slacklining and skateboarding they love to do. We’re big fans of balance bikes. Thanks to ours, Eli was riding a two-wheeler at 3. What I especially love about the KaZAM balance bike is that it unlike the wooden balance bikes you see, this one looks like a big kid bike. That made a difference to our little guy, who wanted nothing more than to ride bikes with the big kids. The Stomp Rocket is our go-to gift birthday gift for boys and girls alike. It’s super easy for kids of all ages to do, and they’re stoked to see just how high they can get the rockets to soar. Hours of fun, I promise. July is always an exciting month at Magic Beans. It’s their birthday month (Happy 8th Birthday! ), which means they’re celebrating big. 31 days big, in fact. Each day in July, Magic Beans is giving away one of their fabulous products. We’re talking big, like Maclaren strollers, Stokke Tripp Trapps, and the one I’m keeping my fingers crossed for – a Playmobil Future Planet collection. Visit the Magic Beans 31 Days of Giveaways! page every day during July to find out what item they’re giving away. In addition, they’re also offering exclusive deals and sales to go along with some of the giveaways. I hope you win – let me know if you do!